Hey Passive Income Pursuit readers! I’m Marvin from Brick By Brick Investing, a blog where I teach the average Joe about investing and how to secure financial freedom by building passive income through the stock market. Quick thanks and shout out to Jonathan for allowing me to grab your attention for a brief moment. Let’s get right to it! When it comes to investing there are two separate camps, fundamental analysis and technical analysis. When you conduct fundamental analysis you establish a value to a company based on assessing its intrinsic value. While technical analysis involves reading chart patterns to determine bullish or bearish patterns. You will see or hear some investors swear up and down that one camp is better than the other. Take Warren Buffet for example, I’m not friends with Mr. B but I would imagine he scoffs at the idea of technical analysis. While a technical analyst could care less about the name of the company or what type business it conducts. They simply want to see the chart and remain as unattached as possible. I believe a great investor uses a balance of both fundamental and technical analysis to evaluate a stock. I say this for a couple reasons. I have seen investors in both the fundamental and technical camps get absolutely clobbered on positions in which their thesis was 100% correct. Based on their analysis they determined the stock would move one way or the other but got the timing completely wrong. You see there is this very irrational type of being called “The Market” which could care less about any type of analysis whether it be fundamental or technical. Mr. Market has a tendency to “act crazy” at times and throw all reasonable logic out the window no matter how sound and methodical it may be. It is because of this that I only associate with Mr. Market when he is in a good mood. A good mood with Mr. Market can be defined as a trend. “Markets can remain irrational a lot longer than you and I can remain solvent." What is a trend? A trend is simply an established pattern of “higher highs and higher lows” or “lower highs and lower lows.” If this is confusing don’t worry I will explain further in a minute. What I want you to understand right now is no matter how strongly you believe in your analysis if it goes against the current trend you are very likely to get crushed. I don’t care how great of a marathon runner you are, if you run at a severe incline for an extended amount of time it is inevitable that you will eventually tire. Let’s take a look at Netflix. The financial collapse of 2008 left many stocks severely undervalued and great bargains. Netflix was an up and coming company that was finding itself in living rooms across the nation. Investors flocked to this growth story in droves. As a result a stock that was previously undervalued now became severely overvalued. At its peak Netflix traded at a P/E ratio of 72! That is absolutely outrageous. For those of you unfamiliar with P/E ratios in short this means it would take 72 years for you to earn your money back on this investment. Now one might think a P/E ratio of 50 is quite insane as well, however if you had tried to short this stock because your fundamental analysis indicated it was overvalued you would have been crushed! A P/E ratio of 50 priced Netflix at $208/share but as you can see the stock marched higher all the way up to $300. That is approximately a 50% increase in value. As I stated before, a bullish trend consists of higher highs and higher lows which I have illustrated in the picture above. A trend is not broken until it makes a “lower low” instead of a “higher low.” In this case that did not happen until July 2011 when the stock broke the $250 support line. Take a look at what happened after that. When a stock becomes that overvalued it typically falls dramatically after the trend ends. 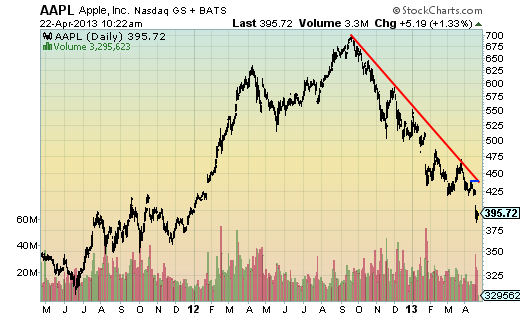 Here is another darling of the stock market, our beloved Apple! I’m sure I don’t need to acquaint you guys with the awesome success of Apple over the past 5 years. For those who are a little unfamiliar, the stock went from approximately $75 all the way to $700, that’s almost a 10 bagger (1000% gain)! Quite extraordinary, definitely an accomplishment that I have not achieved in my investing career…yet! Unfortunately what comes up must eventually come down and Apple is currently taking a beating and slowly approaching a loss of 50% from its peak. Some investors are starting to get interested in Apple’s valuation, they believe it’s a great company and certain technical indicators state that selling volume is drying up but if you take a look at our graph you can see the trend is currently bearish. It consists of “lower highs and lower lows” instead of “higher highs and higher lows” necessary for a bullish trend. Investors are playing with fire if they are trying to hop in and buy this stock. It is much better to identify an established trend than try to catch a falling knife. Some may argue that this approach is too simple and inaccurate but I would challenge you to conduct your own research while back testing this method across a range of stocks. You can use Stockcharts, it’s absolutely free. If you can take anything away from this article today please let it be this, there is no reason to over complicate investing, over time you will soon see that the simplest methods are usually the ones that work. You simply have to be patient. Thank you for your time. It was an absolute pleasure. I hope to see you over at Brick By Brick Investing sometime! Do you incorporate any technical analysis to go along with the fundamentals? Thanks so much for the guest post Marvin! While I think that fundamental analysis should be the foundation of anyone's investment plan, some technical analysis could belong. I know there's been several times where I've figured out what price I want to pay and bought on the way down, just to see another 3-5% get shed off the price. That's extra shares and extra dividend income that I threw away. Thanks again! It was my absolute pleasure! I will admit some technical analysis is a great way to juice your gains. This is a site to view volume and stochastic stockchart analysis. 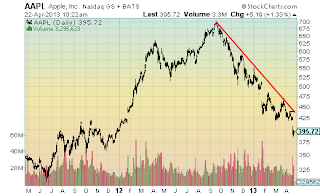 This site provides leading technical indicator analysis and provides a great stock screener.